Let us understand how Employee pension scheme and Employee Provident fund contribution works and how interest is calculated. why your EE amount is much greater than ER amount also in PF balance Inquiry? 1) 12 % of basic salary goes into Employee Provident fund as Employee contribution(EE). 2) 12% of basis salary goes into from employer and this amount is divided in two portion. Employees Pension Scheme ( EPS ) contribution of Rs. 541 /- ( @8.33% of Basic salary upto a maximum of Basic salary Rs.6,500/- PM) is deducted from Employers’ Contribution. Remaining amount goes to Employee Provident fund as employer contribution(ER). There will be opening balance each year and contribution as shown in above example.You will be get interest on opening balance and monthly contribution. So your total contribution will be opening balance + monthly contribution + interest earned on these both contribution. You will get total Employee and employer contribution at the retirement or termination of job. Employee pension scheme contribution gives pension at retirement or pension to your nominee in case of your death. Helped a lot. Thanks for that! really great info..and well explained..
thanks for your comment...nice to know this is helpful to u. Pension Scheme contributions is a loss for us then, if we change the company ?? @Punit, One way it's loss true..But It goes to govt from previous and future companies and If needed Your family gets pension..Lets assume If you are not there tomorrow then your wife will get pension until she gets job but the catch is, this pension amount is not gt8 compare to GOVT Jobs. Thanks very well explained always had a confusion thats its equal contribution from both Employee and employer side, never knew some amount goes to employee pention scheme. This was indeed an eye opener, crisp and clear. Thank you so much JigVishu. At the cost of sounding a little cynical, where does all the money accrued from NPS go, as I am sure many of us don't even bother/know about it and hence do not even claim? ..NPS - You can additionally invest in NPS and get tax benefits.It's similar to EPF but Money is invest in Stock and debt based on chosen option by you and there will be Admin. Charges also...It's not very famous as investment option as of now.. Thanks for the information Vishnu, I have a query on EPS. I have changed the company and applied for the PF withdrawal.As i am closing the previous EPF acct, how the EPS amount is accumulated till my retirement? @Anil, You can not withdraw EPS amount..It will be with GOVT till retirement.then GOVT will give pension to you.. I understand the govt has increased the limit in PPF from 70,000 to 100000. Are you aware of it & can we start depositing in this current year. Will appreciate if you may inform if you are aware. @YT, I am aware in changes in interest rate..I got the info in govt circular -"Assuming the date of implementation of the recommendations of the Committee as 1st December, 2011, the rate of interest on various small savings schemes for current financial year on the basis of the interest compounding/payment built in the schemes"
I think it will be effective from 1st DEC 2011..This info it not clear..so wait for final confirmation on same. @YT, I found it 1st Dec 2011 effective..So All contribution made after this date will be get more interest. Hi, Can you please tell me whether I should expect interest on my PF balance for financial year 2011-12 or not? I left the organization in Jan 2010 and have left the PF in the a/c. Now, i was thinking of withdrawing it. 1) Should I withdraw after Mar'12 to get the interest(if any because there hasn't been any contribution into the a/c since Feb'10)? 2) If I withdraw the funds this month(i.e Dec'11), will I get interest on my balance till Dec'11? You will get interest till your withdrawal request..If you submit request in Dec-11 then you will get interest till Nov -11..
Other point, You will get interest till three years even if there is no fresh Pf contribution.after it will be inactive account and will not earn interest. Just a question -I never saw any deduction against Employee Pension Scheme. So Where this money goes? We can claim it? I am sorry that I could not write article in detail because of critical work at hand..I will write it soon. i have an PF account at Bangalore & i have PF slip for the year 2003 - 2004 and no. KN/24786/200 in the name of U. SATHYA NARAYANA MURTHY & COMPANY NAME: CORPORATE INFRASTRUCTURE SERVICES PVT LTD.
Now, when i am checking my Balance through online. the error message is number invalid. So, please guide me, how to check my PF Balance. Your Account has been marked as In-operative Account. For details please contact respective EPF Office. **Data updated till 03-12-2011 13:30:49 "
There may be no contribution since 3 years so it's Inactive..I request to contact EPFO and withdraw it. i have a PF balance @ ahemedabad office. i want to close this PF account due to my job transfer in government section. so can u tell me the procedure for the how to close and withdraw the money from the PF account without intermendiate my employer? @Ahmedabad, You need to fill form 19 and submit to the EPFO office.But you need stamp and signature from previous employer. 1)I have got SMS from EPF office that my claim was received my them 2 months back, but I have still not got my claim amount till the date.. So what is the time limit for this entire process? 2) What about the refund of Employee Pension Scheme Contribution amount, as I am not going to work with any of any Private or Govt. Organization henceforth. 1)I dont have pensonal experience of claim.But many readers complain about delay in claim..may be 2 months also.Wait for another week or so and then contact EPFO team personally. 2)As you are not going to work again then you can Claim -Refund of Employer share using Form 10C -http://www.epfindia.com/downloads_forms.htm ..You can get much interest on this..It will be your own contribution only. Thanks .... JigVishu for your feedeback. @Colin, Yes earlier I was not clear on that..I did further research on this..Yes you can apply for withdrawal of EPS with Form 10-C. that will be without any interest and you will not be eligible for pension in future..U need to complete 10 years of Job to be eligible..you decide what to do with that. Thks for your inputs . I have a doubt . I have worked in my previous company from Feb 2007 to Mar 2011 , After checking my pf status in sms it shows very less amount EE:9756 AND ER:2980. This is not correct because for 4 years amount deducted per month was 800. Now i have planned to withdraw pf as i have joined a new company . Can i take the pension amount after retirement from the pf account which i am presently withdrawing. @Sowmya, Definitely PF account should be more. Did you check ur ACCOUNT Update Date..It must be very old year..Otherwise amount should be more.Otherwise please check amount before withdrawing it. Regarding- IF you want EPS money with out interest right now then you can fill Form 10-C.. Very clear and informative. Thank you so much. Hi, I have worked in a company 2 years ago, after which I went for furthur studies, now I am joining a new company. Am I still eligible to continue old PF account. Will I be given any interest on old PF amount still lying there & @ what rate? I have worked in a company for 3 months & later joined new company with a new PF account number. I did get relieving letter from that organization. How can I claim PF for those 3 months, I mean is it possible? @Old Pf - YEs You are getting interest since 2 years for old account and It was 8.5% last year and this year it's 9.5..You will get new account in new company..you can withdraw or transfer old account. @worked for 3months, Yes you can contact old employer and ask them to start transfer/withdraw process based on yr interest..You got relieving letter so they have to follow this process also. I have switched to new company and my new company made me open new EPF account with them. However I had EPF account with my previous company. Please suggest as what I should do in this scenario with my previous EPF account,like is there any way to link my previous EPF account with new one or I should close it or is there some other way. Please advice. 2) Transfer old account PF to New Company's EPF account - You can contact new employer to initiate process by providing Old EPF no..It will take 2-3 months..This is will be best option.. I think it comes in 2 different part as You have to submit two separate forms to claim both amount. Did you fill both form 10 and 19? Just wanted to check if i can withdraw EPS by filling form 10C even if i have just worked with an organisation for 6 and a half years or am i eligible only if i have completed 10 years. Yes, You can claim EPS amount by filling form 10c and you will not get pension at retirement. If you complete 10 years then only you will get pension at retirement. I have complated 1 year in an organization after that I have changed the company and I have received form 3A with all EE ,ER and EPS details. If I will transfer my old account to new company then old company EPS and new company EPS both I will get after retirement? Yes, you will get previous ER,ER and EPS when you withdraw after this company or at retirement. Thanks a ton JigVishu, that was very informative. I have a question. Does the withdrawal of PF is taxable? IF you complete 5 years without PF withdrawal then it will be tax free. 2) if you work in company for 2 years then join new company and transfer PF to new company. complete more than 3 years in company and leave then it also it's tax free as you have not withdrawn it after leaving 1st company. Thank You Jigvishu..I actually want to ask some questions but all your above mentioned answer cleared me about PF and its withdrawal. Just want to know that is there any kind of Govt. Website or Book, where all these informations are in writing, so that everyone can understood PF ETC very well. I dont know any book for PF details. You can use govt official website www.epfindia.com for more details ..Please download PDF version which has detail information with all rules..but it's kind of little difficult to understand in 1s reading. i would like to know if the amount deducted from our salary as employees contribution if fully given back to us or there is some kind of deductions from this also by the Gov. employees contribution will be given back fully along with Interest when you withdraw it. 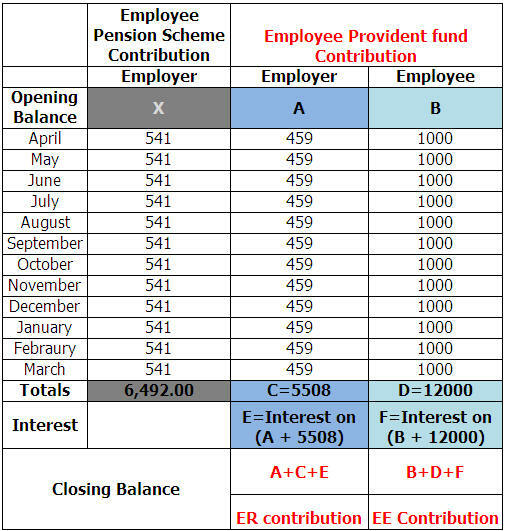 employer contribution's divided into two part EE and EPS...so EE will be given back along with interest and EPS will be given separately when you withdraw or wait till retirement. I have total 5 years experience and after that i resigned and iam abroad now. i submitted 1 letter to withdraw my pf amount in the company which i worked. i got some 25000 in the month of february. yesterday when i checked the balance it is showing EE amot - 54000 and ER amt - 32000. is it because pf amount is paid partially to me? What i need to do to withdraw my full PF? Thanks in advance. somebody had also similar problem. But I dont think they make payments in installments. Please contact employer thru email to check it again. I hope u have worked in same company for 5 years or you have transferred previous balance to this new account. 1. has my EPS contribution also been transferred? 2. if I withdraw my PF stating unemployment reason or PF non applicability, will I be paid the EPS amount? 3. if the ans to 2 is NO, how do I get this amount and when? 1) If you donot withdraw PF then EPS will be transferred too. SO you dont have to worry abt it. 2) While withdrawal, You can fill two forms 10 and 19 to withdraw both account's money..so you will get complete money. 3) If dont withdraw from PF till retirement then you will get retirement benefits. i have worked in company for 11 months. After 2 months from the resignation date , i have applied for PF withdraw. today i got a message EE amount : 5443 and ER amount : 3807. 1)from my account company has deducted 1800 per month as pf . 2)how much amount i can expect . I thing you have left company in before 2-4 months..The EPFO site data is not update till last date...Check ACCOUNT UPDATED DAte and calculate it again...Else please let me know from which date to which date you have worked and what's account updated date in SMS...I will verify it. i have already claim to withdraw our PF amount on Jan 2012. but still i have not received any response. kindly help me ! how to get the information. I have a doubt . I m working in a company from Dec 2009 till date, After checking my pf status in sms it shows very less amount EE:8587 AND ER:2625 as on today, account updated upto 31-03-2011. Is this a correct Calculation, from 14 months amount deducted per month was Dec to mar 512.rs / month, Apr to Sep 546.rs / month,Oct-Mar-2011-564 rs/ month. Now i want to know my current pf balance. Thanks for your great work,but still i m confused with the ER amt what u have mentioned is it 2663.4188 or its 2663 & 4188 , also i want to knw wheter my EE and Er is correct or not, if not den whom should i contact regarding the same . plz can u help me out. Your ER is Rs.2663 and your EE and ER are little less in SMS message than actual amount.. But no major difference...I suggest wait if you are not going to withdraw it soon....do you get any PF statement from office. If a person is still working after 10 years of continuous job, is he eligible for pension while continuing his job? Yes he will be eligible for pension. But he start getting money only after retirement age of 58. A great post !! Hats Off to you as you are doing gr8 social service. Great Post !! Hats Off to you as you are doing gr8 social service !! I also amazed to know why it got rejected.please let me know reason once you get letter. I have calculated data for 42 months without interest. Definately it's very less in SMS than actual. But I have not noticed for inactive/Dormant accounts, SMS info is not correct in some case. hi i am from ahmedabad i am going to leave my current job within 1 month. I have completed 6 years in my current company. I am currently 30yrs. My question is if am going for pension scheme whom should we contact for our pension at the age of 58? Will EPFO will give us a pension without any problem ? Yes, We should be getting pension benefits at age pf 58 without much trouble. You have to fill form 10-D and submit to EPFO office. If you have completed 10 years of service(EPS deposited for 10 years) and some thing happens to you then also your nominee should fill same form to get benefits. I worked for a 'X' company from June 2009 to December 2010.
now i joined another company in July 2012. I have same PF account in X and Y company. Q 1) If i created new PF account in new company and withdraw the amount from my first account. In this case I will loose the EPS contribution amount or i will get the amount at the age of 58. Q 2) If I continued my first account in new company then what will happen of EPS amount? Answer#2- if you continue old pf account (transfering pf money to new account) then eps amount will be continued to be accumulated in govt account so it will be eligible for retirement benefits. note - if you withdraw pf then it will be taxable for you as you have not completed 5 years with same account. I hope you would done calculation as I mentioned in my post..else I need Basic salary and how many months you have worked to calculate EE and ER for you. You can withdraw EPS and PF by filling 10c and 19 at EPFO or old employer. You can Not withdraw it online but you can track your claim online. I have worked for 3 different companies in last 7 yrs. and i have withdrawn my PF from last 2 companies. let me know if there is any way to check my EPS account balance which will be cummulative for the last 7 yrs ( if i am not worng. can u pls explain the EPS details after 10 years of service period. Appreciate your efforts in collating the information and helping the people in need. Thanks a lot for that and I was able to get a clear understanding about PF, EE, ER and EPS just by navigating through the queries by different people and the replies you have given. Once again, A Big Thank you dear friend. Superb post! Thank you very much and wish you a Happy & Prosperous New Year! I understood this concept but I have a question. I calculated EE and ER (EPS+ER). My account has been updated till Mar 31 2012. The amount shown online is very less than my calculations. I even tried deducting the EPS part but it is still lesser than that as well. What could be the reason? The online balance shows two parts 1)EE 2)ER (ER-EPS), right? Some readers has questioned same what you are facing. Even if our calculation is correct for EE and ER but SMS shows less balance. If you are not in process of withdrawing it then you can wait and check SMS balance later. Nice post got a clear cut on my PF. Can you explain about the pension after my retirement age. Say for example I worked for some 6 or 7 company for 15 - 20years and keep transferring my PF a/c. If I have a PF amount of around 5 or 6 lack. At the age of retirement will i get my PF amount back or from my pf amount I will get my pension every month. How long will i get pension. How it is calculated can you give a rough explanation. 1) You will get EPF amount in one shot once you retire. 2) There is seperate contribtion towards EPS. from this fund, You will get pension till you live. In case of death,Nominee will get same. 3) Monthly pension is very less. so you should not depend on this fund for retirement. I worked in a company from June'11 to Sep'12 and they deducted Rs. 5279 on monthly basis. Today I checked my PF account online and got an SMS stating EE amount: Rs. 48083 ER amt: Rs. 43080 as on 11-12-12 (account updated upto 31-03-2102). Kindly suggest this means the showing amount is actual amount till Dec'12 or March'12. If this amount is total balance till Dec'12 then it is too less than my deducted amount. So PF is considered for 1st 9 months. So nothing to worry it's 100% correct. You will get actual when you withdraw it.